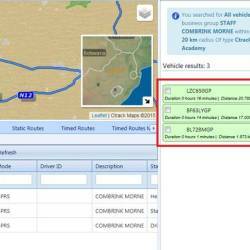 In Online your right click on the map –> select Find Vehicle or Driver Select Vehicle –> select All –> Select Close to POI or Close to Address or any of the other options below Click on Search It will then list vehicles closest to the option you selected. Can I re-configure the C-Track system later? Yes. The system is configurable by you the user, so you can change the configuration settings in the base station software which the system then downloads “over the air” to the units onboard your vehicles. How much will a C-Track IVMS solution cost? C-Track is highly cost effective and competitively priced. Pricing will vary from one organisation to another depending on individual needs in terms of system configuration and numbers of users requiring access. What can C-Track tell me I don’t already know?